I love that my job allows me to spend almost every day of my life in pursuit of quilty pleasures. Crafting new quilting designs, developing new techniques, creating new classes and, above all, cutting up perfectly good fabric into little bitty pieces and then sewing it all back together again to make quilts is my idea of the perfect life and I am forever grateful to my Grandma for setting my feet on this path. The awards and recognition that I have been lucky enough to receive are icing on the cake; my joy lies in being able to wake up every morning and play with my quilty toys. Who ever would have thought that being a grown-up would be so much fun? My work has won numerous awards and has been published in books, magazines, and calendars. 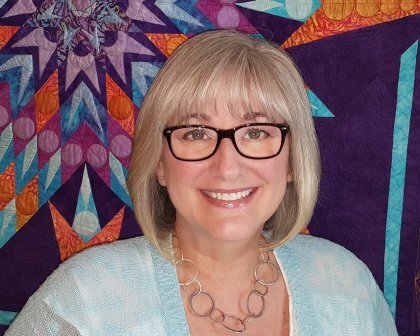 I am the Longarm Classroom Coordinator for Quilts Inc, speak at banquets, write for quilting industry publications, teach at national and international quilt shows, am an instructor at Craftsy.com, and am a proud Ambassador and Retailer for Handi Quilter. Let's make some quilts together!